After hopping for 8 days from Bidar, Gulbarga, Bijapur, Badami, Pattadakal to Aihole, I finally arrived in Hospet on 22nd December 2017. The final destination of my Karnataka trip was Hampi and Anegundi, located in East-Central Karnataka, India. Since I was accompanied by three of my friends, we had booked a Toyota Etios AC with Ganga Tours & Travels. The total rental (Rs. 7,700) included transport from Badami to Hospet (via Banashankari and Mahakoota temples) and sightseeing at Hampi and Anegundi on 23rd and 24th December. On 22nd December, we left Badami in the morning and reached Hospet late evening as we visited Aihole as well, on the way. Also known as Pampa Kshetra, Kishkindha Kshetra or Bhaskara Kshetra, Hampi was the center of Hindu Vijayanagara Empire in the 14th century. Hampi became world’s second-largest medieval-era city after Beijing by 1500 CE. It was the richest city then and hence attracted traders from countries like Portugal and Persia. The Vijayanagara Empire was defeated and Hampi was destroyed by Muslim Sultanates in 1565. Hampi has been in ruins since then. Spread over 4,100 hectares (16 sq.mi. ), this UNESCO World Heritage Site is home to remains of forts, riverside features, temples, shrines, pillared halls, mandapas/ mantapas, royal and sacred complexes, memorial structures, water structures, etc. Anegundi holds a significant place Indian mythology due to its association with the epic of Ramayana. It is believed to be the kingdom of Kishkindha, ruled by the monkey Prince Sugriva. The village has a link with Ramayana due to Anjanadri Hill (the birthplace of monkey-God Hanuman) and Rishimukh Hill (where Sugriva lived with Hanuman, during his exile). Anegundi is also home to one of the oldest plateaus in the world – about 3,000 million years old. A typical visitor to Hampi would cover the entire complex in 2-3 days. Since we had to cover it in a single day, we decided to skip few places/ tourist attractions. We were staying at Hotel Mega Inn at Hospet, some 13 km away from Hampi. We reached Hampi complex at around 10.30 am and headed towards Sri Virupaksha temple, few meters away from the parking lot. Dedicated to Lord Shiva (locally called Virupaksha), the temple is intact among the surrounding ruins. To the left of the temple is the Hemkoota Hill Temple Complex. We bought a map of Hampi and chose to explore all the places on our own (big mistake). We lost our way eventually while finding the Vijaya Vittala temple and took almost 2 long hours to reach the temple. Vittala Temple complex was extremely crowded, all thanks to the popularity of The Stone Chariot. Another major attraction of Vittala Temple is “The Musical Pillars” or “Sangeetha Mandapa”. It consists of 56 pillars that produce musical tones when struck with a thumb. The phenomena is attributed to the presence of metallic ore as well as silica in the pillars. Now that we had lost on a lot of time, we just decided to skip the lunch and see as many places as we could till evening. Honestly speaking, we were so frustrated by then that we simply hopped from one place to another. But in the process, we did manage to cover almost all the major attractions across the complex. I do not wish to describe each and every place here. I would rather let the pictures do the talking. We started our day with a visit to Navabrindavanam/ Nava Brindavana, which is located on an island on the outskirts of Anegundi. A lovely hour long drive on the excellent roads with coconut trees along the roadside brought us to the endpoint for vehicles. From there, it was a walk for some 15-20 minutes. We had to wade through couple of streams and walk on an unusually formed rock bed. We even got to experience the coracle ride while crossing one of the streams. Nava Brindavan is basically a small complex containing the tombs of nine Madhva saints. The premises also has shrines of Lord Ranganatha and Lord Hanuman. Note that men are required to remove their top-wear to be able to make the Parikrama or Pradakshina around the Brindavanams. Our driver then drove us to Durga Temple, not far away from Nava Brindavanam. The temple had a long queue and we were running short of time. Therefore, we decided to give it a miss and moved to Anjanadri Hill. While on the way, we paid a quick visit to Pampa Sarovar, a beautiful lake said to be the place where Shabari, a devotee of Lord Rama, waited to meet him. It is also said that Pampa, or a form of Lord Shiva’s consort Parvati, performed penance at this place to show her devotion to Shiva. Locals told us that it becomes a very picturesque sight when the lotuses in the lake are in bloom. There are also temples dedicated to Lord Shiva and Goddess Lakshmi, in the premises. When we reached the base of Anjanadri Hill, it was well past 1 o’clock. The hill is right opposite Vijaya Vittala Temple across the other side of the river. One has to climb the neatly carved steps to reach the hilltop. It took us about 1 hour to reach the top. A temple dedicated to Lord Hanuman is situated on top of the hill. The highlight of Anjanadri Hill is the view you get to see from the top. The spectacular view of the paddy fields, coconut tree plantations, rocky mountains, Tungabhadra river and of Hampi is simply marvelous. Another attraction of the Hanuman Temple is the “floating stone” kept in a small tank filled with water. The stone is said to be one of the many used for construction of “Ram Sethu”, also known as Adam’s Bridge. We climbed down the hill by 3 pm and headed back to Hospet for a journey back to Mumbai same evening. There’s so much to see in Hampi and Anegundi. We were aware of the fact that we had not allocated enough days for these two beautiful places. Nevertheless, whatever places we got to see in these two days were enough to leave the fond memories of Hampi and Anegundi etched on our minds. The weather is relatively pleasant (Read: bearable) during October to March. Not recommended in monsoon as the boulders become slippery and difficult to walk on. Rail: Hospet or Hosapete Junction has a good rail connectivity to major cities across the country. Bus: Regular AC/ Non-AC buses ply regularly to/ from Hospet by State transport and private bus operators. One may even choose to stay in shacks/ huts at Hippie Island which is on the other side of the Tungabhadra river and closer to Anegundi. First of all, do not make the mistake of allocating only a single day each for Hampi and Anegundi. Two days for Hampi and another couple of days for Anegundi would be enough. Negotiate with local tour guides at Hampi for a day long tour to important places to save on time. A guide gave us an offer of Rs. 1,750 for an entire day. Likewise, negotiate with auto-rickshaw drivers for Hampi and Anegundi sightseeing, if you do not have your own car. I checked with an auto-rickshaw guy, Javed (Mobile: 94492 51678/ 94805 69391) at Hospet and he told me that he charges Rs. 1,500 for two days only for Hampi sightseeing. Hospet is a good place for accommodation. Still try to get your accommodation as closer to Hampi as possible like Kamalapur. This would help you avoid crowd by reaching the complex early morning. You would also get ample time to watch sunrise and sunset. There are total 3-4 Pushkaranis at different locations. Study the map very well or ask local people around to be able to see all of them. Do not forget to enter the Hanuman Temple on Anjanadri Hill and check out the “floating stone”. Be careful with your phones and cameras while getting into and sitting in the coracle. Beware of monkeys at Pampa Sarovar and Anjanadri Hill. Did you like this post? Then follow me on Instagram, Facebook & Twitter for more interesting stuff; and subscribe to my YouTube channel. We managed to cover all these places in 5 days i.e. 21st – 25th December 2017. Located in the Bagalkot district of Karnataka, Badami is famous for its rock cut structural temples. We traveled to Badami by 16536 Gol Gumbaz Express. We boarded the train at Bijapur (4:55 pm) on 20th December and reached Badami in two and half hours. There are not many options when it comes to accommodation and restaurants in Badami. Our stay was at Hotel Rajsangam International, which is right in front of the bus stand and 5 kms away from railway station. Since we had to cover very few spots on Day 1, we started our day quite late. Badami caves are at a walking distance from the bus stand. Or one may even reach there by rickshaw at Rs. 10 per person. Please note that Badami caves, Agasthya Tirtha Lake, Bhutanatha Temples, Archeological museum and Badami Fort all are in vicinity from each of these places. However, to reach Badami Caves, one has to take a turn at Ambedkar Chowk. On the other hand, to reach the Badami Fort (Northern Hill) / Museum, one has to take a turn at the Market. Upon reaching the complex, all these places are accessible on foot. When we reached the Badami Cave Temples (11:30 am), the premises was flocked by school kids and there was no way we could have got clean pictures of the temples. It is advisable to keep Badami Cave Temples and Badami Fort (Northern Hill) on separate days and reach these places early in the morning to avoid crowd. The caves and fort are open from 6 am to 6 pm. The parking charges are: Bus/ Truck (Rs. 30), Car/ Van (Rs. 15), Scooter/ Bike (Rs. 5) & Bicycle (Rs. 2). The place is maintained by Archeological Survey of India (ASI) and entry fees are Rs. 15 (for Indians) and Rs. 200 (for Foreign Nationals), per person. For Camera, charges are Rs. 25. Badami Cave Temples is a complex of four Hindu, Jain and Budhhist cave temples. The place is a fine example of Chalukyan rock-cut architecture. The last of the four temples is a Jain temple, dedicated to the Jain Tirthankaras. Entry to the Badami Fort (part on Southern Hill) which is right above the Badami Cave Temples is restricted. Considered to be inaccessible now, this part of the Fort has a large cannon on top. We then moved to the museum located at the base of the Badami Fort and next to the Agasthya Tirtha Lake. The museum has 4 galleries and it mainly comprises of pre-historic stone implements and sculptures, architectural members, inscriptions, hero stones etc. Entry fee is Rs. 5 per person and photography/ videography inside the museum is prohibited. It is open from 10 am to 5 pm. From museum, we walked along the banks of the lake and reached Bhutanatha Group of temples. There are two major temples there – the one on the East side of the lake is Bhutanatha Temple and the one on North East side of the lake is the Mallikarjuna Temple. While walking along the banks of the lake, one could get a picturesque view of Bhutanatha Temple with its reflection in the lake water. Behind Bhutanatha Temple, there’s a Buddhist cave with a small entry. One has to crawl on knees to enter this cave. We started our day at 6:30 am and headed to the part of Badami Fort on Northern Hill. A rickshaw driver dropped us to archaeological museum for Rs. 40. To the left of the museum is the entry gate of the Fort. Although the fort was built during Chalukyan period in 6th century, most of the present day work was done during 18th century under Tipu Sultan’s rule. The walkway inside the fort is carved out of a large redstone hillock. The steps and doorways are cut so precisely that makes one appreciate the finesse of architects then. While on the way to the top of the hill, one comes across a huge bastion and two temples – Lower Shivalaya and Upper Shivalaya. The Lower Shivalaya is relatively smaller in scale with two storeys. The Upper Shivalaya is built in a typical Dravidian style. From Upper Shivalaya, one can get a panoramic view of the city. On the other side, one gets the aerial view of Badami Cave Temples, Agasthya Tirtha Lake and ruins of a Buddhist temple on the other part of the hill. A rectangular structure called Tipu Sultan’s Treasury is few feet away from Upper Shivalaya. The structure is completely in ruins and is accompanied by granaries nearby. We descended the hill by 8:45 am and still there were no visitors. The place looks quaint in early morning as the sun rays hit the redstone surface of the hill. We reached our hotel to freshen up and left for Pattadakal in a Private car. Popularly called as Banashankari, this ancient temple is 5 kms away from Badami on the way to Gadag. A high wall encloses the temple on all sides. A large square water tank called as “Haridra Tirtha” is located in front of the temple. The stone mantapas enclose the tank on three sides, called as “Pradakshina” path. While on our way to Pattadakal, we took a halt at Shivyog Mandir and then moved to Mahakoota Group of Temples. Built between 6th to 8th century, the complex is totally dedicated to Lord Shiva. The architecture style resembles the one seen in Pattadakal and Aihole. The site has historical significance due to two inscriptions found there. The Pillar inscriptions (Dharmavijayastambha) depict the Chalukyan achievements. The Porch inscriptions (Vinapoti) are related to the tale about grant of a silver umbrella and rubies to the lord, by Vijayaditya. The complex also has a tank with a natural spring. We reached Pattadakal at around noon and unfortunately got a company of some more school kids. Pattadakal (a place of coronation) is a complex of ten Hindu and Jain temples dating back to 7th century. Also called Raktapura, the site is managed by ASI and is a UNESCO World Heritage Site. The nine Hindu temples are dedicated to Lord Shiva whereas the lone Jain temple is dedicated to Jina, a Jain Tirthankara. The coronation of Chalukyan kings used to take place at this very site. Located on the banks of Malaprabha river, the temples reflect a fusion of two major Indian architectural styles – one from north India (Rekha-Nagara-Prasada) and the other from south India (Dravida-Vimana). The oldest of these temples is Sangameshwara whereas the last temple built in the group is the Jain Temple, built in 9th century. The largest of these temples is the Virupaksha Temple. Since there was a lot of crowd (thanks to the school trips), I couldn’t take clean pictures of the beautiful temples. It is advisable to visit the site as early in the morning as possible. The Papanatha Temple is isolated from the rest of the monuments in the group and hence is less crowded. In fact, when I took a walk to this temple, I found myself to be the only person at that temple. The entry fee for the complex is Rs. 30 (for Indians) and Rs. 500 (for Foreign Nationals) per person. Camera/ Video charges at Rs. 25. Aihole is like a hub of Hindu, Jain and Buddhist temples dating from 6th through 12th century. The temple groups mentioned above include more than 120 stone and cave temples. There are more than 100 Hindu temples, few Jain ones and one Buddhist monastery spread across 5 sq. km. space. Although all temples are close by, exploring all of them would take more than a day and a lot of patience too. Among all the Temple groups in Aihole, Durga Temple is the major tourist attraction due to its architecture. The entry fee is Rs. 15 (for Indians) and Rs. 200 (for Foreign Nationals) per person. Camera/ Video charges at Rs. 25. After leaving from Aihole at around 4 pm, we moved to Hospet for the last leg of our Karnataka trip – Hampi & Anegundi. September to February since the weather is quite pleasant. Air: Nearest airports to Badami are Hubballi Airport (105 kms) and Belgaum Airport (150 kms). Rail: Badami has a railway station which is well connected to major cities in Karnataka and nearby states. Nearest major rail junction is Hubballi. Road: Badami has a good road connectivity with Hubballi, Dharwad, Belgaum, Bangalore, Bagalkot, Hampi, Bijapur which have further connectivity with other cities in nearby states. Pattadakal and Aihole are 20 kms and 33 kms away from Badami respectively and can be reached using bus or cabs. Visit Badami Cave Temples and Fort early in the morning to avoid crowd and witness a wonderful sunrise. At Badami Cave Temples, shooting videos with smartphones is not allowed. However, it is allowed with a DSLR camera. Strange, right? To capture photographs under good natural light, visit Badami Fort (Northern Hill) at sunrise, Bhutanatha Temple in the afternoon and Badami Cave Temples in the evening (pray that it is not crowded). Please note that New Lemon Tree Family Restaurant in Badami is permanently closed. Although the Bijapur fort played a major spoilsport, the other places compensated for that. I, along with my three friends arrived in Bijapur on 18th December 2017 late evening. We traveled by a KSRTC bus (ticket per person: Rs. 151), from Gulbarga. We were supposed to leave for Badami on 20th December by train at 5 pm. So we had almost two full days to explore Bijapur. Our stay was at Hotel Pearl, which is about 500 metres away from the Gol Gumbaz. After reading this list, you must have realised why I chose this title. After having the breakfast at local Kamat Hotel (not the chain, but food was good), we began our day with Bara Kaman. A rickshaw driver agreed to drive four of us to Bara Kaman, Uppali Buruz, Malik-i-Maidan, Jod Gumbaz, Taj Bawdi and Ibrahim Rauza (in same sequence) for Rs. 450. Please note that all these places are close by and we covered them all in 4-5 hours. Our first destination was Bara Kaman (Twelve Arches) which is hardly 2 kms away from Gol Gumbaz. It’s an unfinished mausoleum of Ali Adil Shah II. Built in 1672 AD by Ali Adil Shah II, the site is presently managed by the Archaeological Survey of India (ASI). The security guards over there told us the history of the structure which is quite interesting. The twelve arches were supposed to be placed vertically as well as horizontally surrounding the tomb of Ali Adil Shah II. Once completed, the structure would have been bigger than Gol Gumbaz, the mausoleum of Mohammed Adil Shah, the Sultan of Bijapur and father of Ali Adil Shah II. For the very same reason, Mohammed Adil Shah murdered Ali Adil Shah II and the construction of Bara Kaman remained incomplete. The mausoleum has the tombs of Ali Adil Shah II, his wife Chand Bibi and his daughters. Our next destination was the Uppali Buruz also known as Haider Buruz. Built in 1584, this 80 feet tall watchtower has a spiral staircase to the top. The structure was built by Haider Khan, a commander-in-chief under Ibrahim Adil Shah II. From the top, one can get a panoramic view of the Bijapur city, including Gol Gumbaz, Bara Kaman, Jamia Masjid, Jod Gumbaz. The Buruz must have been built to keep the invaders off the city. There are two big long cannons on top of the structure, probably 30 feet in length. Probably the best surprise of the Bijapur trip. My excitement to see Malik-i-Maidan had receded when I saw its pictures online, before the start of the trip. But as they say – “you gotta see it to believe it”. As a general perception, the longer the cannon, the more stronger and effective it seems. But in Malik-i-Maidan’s case, all you see in pictures is a small cannon and that too with a name which translates to “Master of the Battlefield”. You start wondering why such name and why even see it. But hold on…all your “whys” turn into “hows” the moment you see this giant in real. The cannon is placed on a tower between two bastions and is visible within the citadel of Bijapur Fort. When I got the first sight of this gigantic gun, my first reaction was “Damn, its a monster”. And its muzzle proves it right. It is designed in the form of a lion head with carved jaws as if it is devouring an elephant depicted between the jaws. After Malik-i-Maidan, we moved to Jod Gumbaz, the twin tombs dedicated to “Traitors”. Yes, you read it right. Completed in 1687 and located close to the Mecca Gate in Bijapur, the tombs were built in memory of Khan Muhammad and Abdul Razzaq Qadiri. This father-son duo had helped Aurangzeb defeat the young Sikandar Adil Shah. Also called as Abdul Razzaq Dargah, the structure has two domes and beautifully carved chambers. Jod Gumbaz in located in a garden which has now become a picnic spot. People have made a mess of this beautiful structure by littering everywhere. Therefore, if you get a clean photograph of Jod Gumbaz, consider yourself lucky. Taj Bawdi is a massive well, built by Ibrahim Adil Shah in memory of his wife, Taj Sultana. Constructed in 1620, it is a 223 sq ft and 52 ft deep well with arches and steps. Please note that the entry to Taj Bawdi is restricted. Our driver told us that since people started dumping garbage in the well, the authorities had to close entry to this marvellous structure. I was totally unaware of what Ibrahim Rauza was all about. I was under impression that it would also be a just another tomb. But it actually turned out to be one of the best monuments I saw during our entire trip. Ibrahim Rauza was built by Ibrahim Adil Shah II as a future mausoleum for his wife Taj Sultana. But ironically, he was the first one to be buried there as he died before Taj Sultana. The structure consists of a tomb and a mosque facing each other within a square complex. The tomb and mosque are constructed on a common raised terrace with a large tank and fountain between them. The mosque has a rectangular prayer hall with a facade of five arches. The tomb has some of the most elegant carvings on the walls and ceilings. On the interior, each wall has three arches, all embellished with floral and arabesque traceries. The tomb houses the graves of Ibrahim Adil Shah II, his wife, mother and children. The monument is well maintained by ASI and the entry fee is Rs. 20 per person. Apart from this fee, you have to pay Rs. 10 per person at the shoe counter. We covered all these places by 3 pm and had our lunch at a nearby restaurant. Our final destination for the day was Afzal Khan’s 63 Wives graveyard which is 4 kms away from Ibrahim Rauza towards Miraj. A rickshaw driver agreed to drive us to the graveyard, Barishpur and back to our hotel for Rs. 150. The locals call this graveyard “Saath Kabar” (sixty graves). We were following the location on Google Maps only but made a mistake by listening to this driver and went ahead along the Miraj-Bijapur Road. This photo is taken from Barishpur. The Saath Kabar is believed to be somewhere near the dome visible in centre. Though we didn’t get to visit this place, I will mention the history associated with it in brief. Afzal Khan, a renowned army chief of Ali Adil Shah II, had vowed to defeat and kill Chhatrapati Shivaji, the first king of Maratha Empire. Before setting out for the battle in 1659, his astrologers had predicted that he would die in this war. Therefore out of jealousy that his wives would remarry after his death, he killed his 63 wives and buried them at this place. Missing out on the Saath Kabar actually brought us to a place which we had never ever read or heard about. There are two isolated palaces located along the Miraj-Bijapur Road called “Sangeeth-Nari Mahal”. It is mentioned over Internet that Sangeeth Mahal is also called as Nari Mahal. We somehow felt that the palace located outside the boundary wall could be the Nari Mahal. The gates of Nari Mahal were closed. Sangeeth Mahal is much bigger than Nari Mahal. Also known as “Navraspur” locally, the Sangeeth Mahal was built by Adil Shah II, to bring cultural harmony between Hindu and Muslims through music. The palace is surrounded by an octagonal high wall and has a massive tank in front of it. To keep the tradition of this king alive, district administration used to organise “Navraspur Utsav”, a musical concert on the premises of this monument. It was last organized sometime in 2015 post which this place got totally neglected by the administration. See how amazing this palace looked during the event in 2015. Barishpur is about 5 kms away from Sangeeth Mahal and 7 kms away from main city. It was supposed to be a project on awareness about water conservation. There are statues placed depicting the Do’s and Don’ts when it comes to saving water. However, it seemed that the administration has not been able to attract tourists and local population to this place yet. When we reached there, it was all empty. After Barishpur, we did have enough time to look out for the exact location of the Saath Kabar and Afzal Khan’s Cenotaph (which is close to Barishpur), but we somehow decided to call it a day. Our first destination on second day was Jama Masjid located about a kilometre away from our hotel. Also known as Jamia Masjid, Jumma Masjid and Jami Masjid, it was built by Ali Adil Shah I, to commemorate Adil Shahi’s victory over Vijayanagara empire. The mosque is in the shape of letter “L” wherein a long passage is connected to the main prayer hall. The structure of the Masjid is somewhat similar to other old mosques with Indo-Islamic style carvings on walls and strong pillars. It was considered to be the biggest mosque during the Adil Shahi kingdom. After visiting Jama Masjid, we moved to Mehtar Mahal which is along the same road. While on the way to Mehtar Mahal, we came across Badi Kaman, which is an old and “not that big” arch. We started our day on foot only and reached Mehtar Mahal in 10 minutes after leaving Jama Masjid. Mehtar Mahal is a three storeyed beautiful building with three arches. The doorway leads to the Mehtar mosque. There are steps to go up to the terrace. The upper floors have small rooms with ceilings and walls intricately carved. The structure has a flat roof and a door on first storey to an open passage. Built in 1646 by Mohammed Adil Shah, Asar Mahal is a 10 minutes walk from Mehtar Mahal. It is a well maintained palace which was used as a Hall of Justice. There is a large artificial lake/ tank in front of the palace. One of the caretakers told us that the place is sacred as it is said to hold two hairs from Prophet Mohammed’s beard. The structure showcases significant use of wood in its architecture. The entry to the upper floor of the palace is closed. Also, women are restricted from entering this place. We walked our way to Gagan Mahal or literally a Heavenly Palace. Built by Ali Adil Shah, the palace has three arches with the middle one being the widest. The ground floor must have been used as the Darbar Hall whereas the first floor was used as a private residence of the royal family. Gagan Mahal is very much similar to Sangeeth Nari Mahal. I don’t remember the other charges for Foreign nationals. When you enter the Gol Gumbaz premises, you get a feeling that it is a single structure. But the front part which is visible is actually the Archaeological Museum. Initially a part of the Gol Gumbaz building, this structure called Naqqar Khana was later converted into a museum. Naqqar Khana means House of Drums. It was a custom to welcome the King’s guest by beating the drums then. The museum has some of the best and rare artifacts from the history. It includes stone inscriptions of Arabic, Persian, Kannada and Sanskrit languages in different scripts written in beautiful calligraphy. It also houses plain manuscripts, coins, China wares, wooden carving, carpets, maps, sanads and firmans, miniature paintings from 6th to 18th century. There are six galleries – three on ground floor and the rest on upper storey. Right behind the museum is the World’s second largest dome after the Pantheon (Italy). Gol Gumbaz is actually a cube, capped by a dome. Once you enter through the door, you get to see the mausoleum in the centre on a raised platform. We were aware that we had visited Gol Gumbaz at the worst possible time. We went in the afternoon only to realise that we had more than 500 school kids for company. The ASI official told us that the best time to visit Gol Gumbaz is when it opens for visitors – 6 am in the morning. Around that time, you would find only those who want to experience what the “Whispering Gallery” is. A vast circular passage called “Whispering Gallery” inside the dome is very popular among tourists. As the name suggests, even the softest sound can be heard on the other side of this gallery due to the acoustics of the space. There are steps that lead to the Whispering Gallery but for that one has to climb seven storeys. When we reached the Whispering Gallery, all we could witness was people shouting and screaming their guts out. It was clear that they didn’t even know the significance of the place and structure. Still, one of my friends walked to the other side of the gallery (standing right in front of us). He dropped a coin on floor and to our amazement, we heard the sound even in so much of noise. You must have noticed that I haven’t written anything about Bijapur Fort, Sath Manzil, Jala Manzil and Anand Mahal. That’s because we actually couldn’t find these places. And even the locals were unaware of them. We found Bijapur Fort totally in shambles. We could see only the fort boundary wall and nothing inside. There was an administrative office in place of Anand Mahal. After finally completing our Bijapur itinerary, we headed to our next destination – Badami. Rail: Bijapur railway station is well connected to cities like Mumbai (via Solapur), Hospet, Hyderabad, Bangalore, etc. Road: Bijapur is well connected to most of the major cities in the country. KSRTC and Private buses ply regularly between Bijapur and nearby cities. Please visit Gol Gumbaz as early as possible to avoid crowd. For the coin experiment in Whispering Gallery, make sure the other person stands in front of you on the other part of the gallery. Better follow Google Maps for Saath Kabar and Afzal Khan’s cenotaph. You can save on time by skipping Barishpur since there isn’t much to see there. The stepway inside Mehtar Mahal is narrow and at one point there’s a dead end and you can’t turn around. Better not to carry a backpack or you might end up getting stuck. Women are not allowed to enter Asar Mahal. Exploring Gol Gumbaz would take minimum three hours – about an hour for museum and couple of hours for main building. Museum opens at 9 am. So one may visit Gol Gumbaz at 6 am for sunrise and an empty whispering gallery and spend time till 9 am to visit museum. Guides from ASI are available at Gol Gumbaz for charges of around Rs. 250-300. Gulbarga doesn’t actually boast of any special monument or a historical fact but it does have a lot more beyond just the fort. Officially known as Kalaburagi, Gulbarga was the capital of Bahmani Empire from 1347 to 1424 AD. In 1422 AD, Gisu Daraz of the Sayyid family (descendents of the Prophet) was buried here, which transformed the Deccan from a land of infidels, open for conquest by Muslim invaders, to an Islamic sultanate, under the Bahmani dynasty. I, along with my 3 friends arrived in the city late evening, by a KSRTC bus from Bidar (bus ticket Rs. 113 per person). We stayed at Hotel Heritage Inn, which was at a walking distance from the Fort. We were supposed to leave for Bijapur next day evening. So we had to start our day early next morning so as to cover all above places. Please note that we commuted to all places by a single rickshaw for all four of us. Therefore, all rickshaw expenses are for four people. Gulbarga Fort was built by Raja Gulchand of Warangal. It was strengthened by Ala-ud-din Bahmani afterwards. The fort occupies an area of 74.10 acres and a circumference of 3 kms with two rounds of fortifications. The outer fort wall is of lesser height than the inner wall. There is a 30 feet deep moat around the fort. The fort carries Tene (or Kanguras) at regular intervals and has 15 bastions and 26 guns. The principal gateways on the Eastern and Western sides consists of pointed arches with openings flanked by bastions, approached by bridges across the moat. There is a continuous parapet of merlons, raised over the gateways, provided with narrow openings in them to fire the muskets. The major highlight of the fort is the Bara Gazi Toph (featured image of this post). Measuring 29 feet, it is the longest cannon in the world. It is made up of alloy (Panch Dhatu in Hindi). The circumference is 7.6 feet, diameter 2 feet and the thickness is 7 inch. Apart from this, Jamia / Jumma Masjid and Ranmandal are the noteworthy structures present. In fact, the Ranmandal is a strong and well-maintained structure that has 3 cannons atop. The palace and the other structures inside the fort are in ruins. After leaving Gulbarga Fort, a rickshaw driver agreed to take us to Haft Gumbad, Shor Gumbad and back to our hotel for Rs. 300. On an average, it takes 15 minutes to reach Haft Gumbaz from the fort and 30 minutes to reach Chor Gumbad from Haft Gumbaz. The Haft Gumbaz, meaning “seven domes”, is a mausoleum of the Bahmani royal family, located on the outskirts of Gulbarga. Five of the tombs are identifiable as those of Mujahid Shah Bahmani, Daud Shah Bahmani, Shams-al-din and Ghiyas-al-din Bahmani and Firuz Shah Bahmani. The earlier tombs show predominant Tughluqi influences. The latest and most elaborate tomb that of Firuz Shah shows traces typical of what became the Bahmani style of architecture. It became the first Islamic style of architecture in Deccan that deviated completely from Tughluqi precedents. The most intriguing part of our trip to Gulbarga was this lone tomb called Chor Gumbad. The structure doesn’t contain any tomb. It could have been built as a victory monument. If you connect the locations of Chor Gumbad, Gulbarga Fort and Haft Gumbaj on a map, all three points would come in a straight line. The tomb is easily visible from the Gulbarga fort. It has an entrance to the East, facing the fort. The structure has one of the finest stucco works on its ceilings. There are steps that lead to the upper floors from where you could get a better view of the beautiful ceiling. You may even go to the terrace which has four minarets on corners. Although a protected site under Karnataka State Archaeology, this beautiful structure is completely neglected and in ruins. Since we were running out of time, we had to skip Hazrat Khwaja Banda Nawaz Dargah and spent time at Sharana Basaveshwara Temple for hardly 5 minutes. Air: The nearest airport to Gulbarga is Rajiv Gandhi International Airport, Hyderabad (236 kms away). Train: Gulbarga has a local railway station which has good connectivity with important railway stations like Bengaluru, Hyderabad, Mumbai, Aurangabad, Nanded, etc. Road: Buses by KSRTC as well as Private operators ply between Gulbarga and important cities nearby. Start your day early and you will be able to cover all places in a single day. The officials at Haft Gumbaz don’t allow video shooting in the premises. You may have to convince them that you don’t belong to media/ entertainment industry. Remember that Chor Gumbad and Haft Gumbaz are on the opposite sides of fort. Plan your itinerary accordingly to save time. Located in the north-eastern part of Karnataka, Bidar city is the headquarters of Bidar district which borders with Maharashtra and Telangana. Bidar was the capital of Bahmani kingdom(1425 – 1487) and later of Barid Shahi dynasty (1492 – 1619). The city has a prominent place on the Archaeological Map of India, having many sites of architectural, historical and religious importance. Out of the 61 monuments listed by the Department of Archaeology, Museums and Heritage in Bidar, about 30 are tombs scattered in and around the city. I was accompanied by three of my friends who had to bear with me and cover all the cities mentioned above in 10 days (15th – 25th December 2017). Please note that we commuted to all places every time by a single rickshaw for all four of us. Therefore, all rickshaw expenses are for four people. We boarded the 22143 Mumbai CSMT – Bidar SF Express at Dadar at 9:15 pm and experienced one of the worst train journeys in life. We travelled in an Sleeper coach and it was a big mistake. Simply book in AC compartment if you do not wish to face nuisance from those who don’t have reservation. After 12 hours of annoying journey, we reached Bidar at 9:30 am next day. I had made the booking at Hotel Shiva International near Bidar bus stand, which is 2.5 kms away from railway station. A rickshaw driver accommodated four of us in his rickshaw and charged us Rs. 50 for dropping us at hotel. It was lunchtime by the time we all freshened up and therefore decided to have lunch at the nearby Vaishnavi Restaurant. After lunch, we headed for Shri Jharni Narasimha Cave Temple (6 kms away from bus stand) in a rickshaw for Rs. 80. It is a cave temple associated with Lord Narasimha, an incarnation (avatar) of Hindu god Vishnu. The ancient temple is excavated in a 300 metre tunnel under the Manichoola hill range. The temple was flocked by devotees and we decided not to enter the temple as there was a long queue. The temple premises has a large hot water spring/ pool for devotees to bathe in. From there, a rickshaw driver agreed to drive us to Bahmani Tombs (5 kms away from Narasimha Temple), then to Chaukhandi of Hazrat Khalil Ullah (1 km from Bahmani Tombs) and then back to our hotel (8 kms) all for Rs. 300 (seems expensive but the guy was going to be with us till evening so that was okay). Situated in the Ashtur village, the place is literally a complex of huge tombs. Out of the 13 tombs, 9 belong to the Bahmani Sultans and other 4 belong to their wives. It is located some 9 kms away from the city centre. For Bahmani Tombs, you drive along the Mangalpet Road from Narasimha Temple and then take a detour to drive along the Ring Road. After another detour along the Ring Road towards Ashtur, you get to see Chaukhandi; another kilometer ahead of that and you get to see huge domes which are the Bahmani Tombs. It took us 15-20 minutes to reach there from the temple. The earliest and grandest among them is the Tomb of Ahmad Shah-al-Wali, the ninth king of Bahmani dynasty. Built in 1436 AD, it honours the Sultan who shifted the Bahmani capital from Gulbarga to Bidar. The tomb displays continuing Persian influences of the time, as well as a synthesis between Indic and Islamic cultures. The monument is unique as it is the only tomb at the site under veneration. The tomb is a square, domed structure with three tiers of arched recesses. There are four recesses, each on the bottom and middle floors, and seven on the highest of the three floors. The tomb is decorated with calligraphic bands and inscriptions. Foliate and arabesque designs are painted on the interior of the tombs and have retained their original color. While the most recurring color schemes include vermilion, turquoise and gold, there are also instances of cobalt, gray terra-verde and buff. Near the tomb of Ahmad Shah, is that of his wife which essentially has the same layout, on a much smaller scale. However, it is placed on a four feet platform and rises about 29 feet above the Sultan’s own tomb. A guide named Sultan Khaleel Shah Bahmani claimed to be the descendent of Bahmani dynasty. He showed us couple of coins from the Bahmani era. You may contact Sultan on 09739486771, to guide you about the place and its history. You may also check his credentials on Youtube here. There’s a tomb which is partially collapsed but gives a wonderful view of the interiors of the dome. It belongs to Humayun Shah, son of Sultan Allauddin Shah. The structure seems like a cross-section cut model of a tomb. Sultan told us that the two walls and most of the dome collapsed due to lightning. The tomb of Malika-i-Jahan, wife of Humayun Shah is diagonally opposite to Humayun Shah’s tomb. After spending more than an hour at Bahmani Tombs, we moved to the Chaukhandi which is a tomb of Hazrat Khalil Ullah. He was a spiritual advisor of Sultan Ahmad Shah. The structure showcases stucco work on walls, intricately carved pillars and beautiful arched doorways. The tomb is a two story octagon with a freestanding square domed tomb chamber within. The doorway walls are adorned with beautiful calligraphy depicting Quranic verses. There are 3 graves in the main vault and several others in the premises. The outer walls of the octagonal structure are designed as panels outlined by a black carved stone. There’s also a big step well within the premises. Having left from our rooms at 6 pm, we reached Papnash Mahadev Temple (2 kms away) by rickshaw (Rs. 100 including journey back to Gurudwara Nanak Jhira Sahib). The temple is located in a beautiful valley and has a natural spring pond, called as “Papnash”. It is believed that Lord Ram while returning from Lanka installed a Shivalingam in this temple. The old temple was lost and at the ruins of that, a new one was built later. Though the place is very popular and is flocked by the devotees round the year, we saw very few people and thus got to experience the serenity of the place. There’s also a food court in the premises near the Papnash lake. A beautiful sarovar (sacred pool) is built in front of the Gurudwara stairs. The water from Sri Nanak Jhira (natural spring) is directed to this pool for pilgrims to take holy dip. During his second tour to Deccan from Sultanpur (Punjab), Sri Guru Nanak Devji reached Bidar via Rajasthan, Madhya Pradesh and Maharashtra. The people of Bidar requested him to bless them with sweet water as the water in Bidar was salty. Sri Guru Nanak Devji remembered God and touched the hillock with his right foot and a spring of sweet water started flowing from this place and since April 1512, it is flowing continuously till date. After visiting the Gurudwara, we had our dinner at Rohit Restaurant which is on the way to main road from Gurudwara. The present-day Bidar fort was rebuilt using red laterite stone around the old fort in 1428 by Ahmed Shah Bahmani. Constructed on the edge of the plateau, Bidar fort has a haphazard rhombus-shaped layout. There are over 30 monuments inside the fort. Gates 3 and 4 are without a name. The ingeniously designed Mandu Darwaza has its entrance through a well defended underground tunnel. The Bidar fort museum has an excellent collection of cannons, iron balls, muzzle loaded guns (muskets), padlocks and keys, Chinese porcelain, swords, daggers, spearheads, artifacts from Chalukyan, Rashtrakuta and Saatvahana eras, arms and armory, stone age axes from Maski (a Saatvahana pottery form), etc. Unfortunately, The Rangin Mahal and Gagan Mahal were closed for repair work. Rangin Mahal is situated near Gumbad Darwaja and we were told that it is unique due to its decoration with coloured tiles and other art work. Solah Khambah Mosque derives its name from the 16 pillars erected in the middle portion of the prayer hall. Built by Qubil Sultani, the mosque is also called Zanana Masjid and is one of India’s largest mosques. The mosque’s large prayer hall is divided into aisles by massive circular columns. The tops of these pillars have simple foliar decorations. The roof is crowned by a majestic dome raised on a high clerestory with windows of perforated screens in different geometric patterns. In 1656, when Aurangzeb conquered Bidar, it was in this mosque that he had the khutba (prayers) recited in his father’s name to proclaim his sovereignty over the newly acquired territory. Next to Solah Khambah Mosque is Tarkash Mahal, which possibly got named for having built for a Turkish wife of the king. The ground floor has a series of rooms with vaulted roofs built in four rows, one behind the other. On the first storey is a principal apartment consisting of a hall divided into eight bays by the insertion of massive arches. Beyond this hall, towards the north are two more halls. Beyond the halls is an open space. The uppermost storey consists of a hall in the centre and small rooms on either side. The walls in many of these rooms are beautifully decorated with coloured tiles and stucco work. The Takht Mahal or Throne Palace is located in the Old fort area. Built by Ahmad Shah Wali, it is one of the grandest buildings in the fort. It is noted for its stately dimensions, its fountains, and its exquisite surface decorations with coloured tiles and stoned carvings. The Takht Mahal reflects the strong Persian influence on Bidar’s architecture. It has on its two sides royal pavilions with lofty arches and a spacious hall, at the back of which was the Sultan’s room. The coronations of several Bahmani and Barid Shahi Sultans were held here. If you intend to explore the entire fort, make sure you start the day as early as possible to avoid the crowd and spare minimum 3 hours for the exploration. The fort is open from 9 am to 5 pm. After exploring the Bidar Fort, we moved to Madrasa of Khwaja Mahmud Gawan, a distinguished example of Bahmani architecture (Persian style). It was built in 1472 by Mahmud Gawan, the Bahmani dynasty’s celebrated Persian origin Prime Minister, who served Muhammad Shah III from 1458 to 1481. 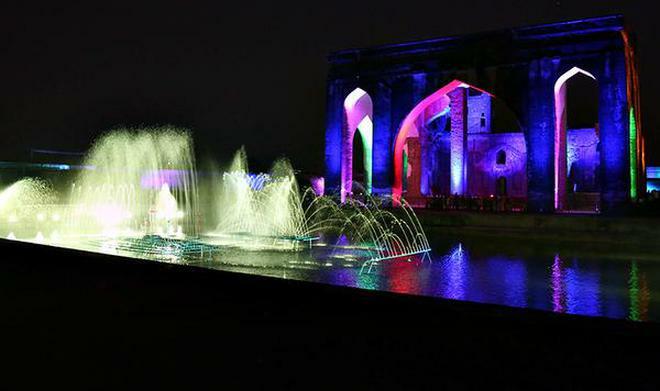 It functioned like a residential university and was maintained on the lines of the Madrasa of Khurasan. This three storeyed building houses mosques, library with 3,000 books, lecture halls, professors’ quarters and students’ cubicles. The minaret was lavishly decorated with Persian style green, blue and white glazed tiles set in zigzag patterns and calligraphic text. After having our lunch at Royal Anmol Restaurant, we went to the Barid Shahi Park (Rs. 50 by rickshaw), which is a complex of tombs of Barid Shahi clan. The entry fee of Rs. 5 is applicable. The 55 acre garden houses many graves belonging to the royal line of Ali Barid Shah. The most notable among them belong to Ali Barid, Qasim Barid, Ibrahim Barid Shah and Chaand Sultana. We had to skip Chowbara (a large clock tower situated near Mahmud Gawan Madrasa) and 108 feet statue of Basaveshwara as we had to board a KSRTC bus for Gulbarga. July to September (monsoon) is the most visited period. However, November to January is the best time to visit. Train: Bidar has a local railway station which has good connectivity with important railway stations like Bengaluru, Hyderabad, Mumbai, Aurangabad, Nanded, etc. Road: State highway, SH4 passes through Bidar, making it easily accessible from different parts of Karnataka by road. Apart from KSRTC buses, private bus operators like VRL Travels, SRS Travels, Pooja Travels, etc also provide bus services to nearby cities. If you are not a religious person, you may skip the Narasimha Temple and go directly to Bahmani Tombs. Remember that you will have to wait in the long queue and wade through chest deep water to reach the main temple. Do not forget to see the Ahmad Shah-al-Wali tomb from inside. You may have your dinner at the Langar of Gurudwara as well. Start your visit for Bidar fort early. Exploring the fort will consume a lot of your time and there are many things to see inside the fort.